Are you in town and looking for something fun to do? Then look no further than Quiz Master Frank’s weekly pub quiz at Tristan’s CalMex Restaurant & Bar, held every Wednesday from 8.30pm till 10.30pm. It’s free to participate in the quiz and the top three teams will walk away with prizes, including tequila, beer and tacos! If you’re still not convinced, then maybe this will be enough to get you off the couch: RMB35 margaritas! For more information, or to place a reservation, contact Frank on WeChat (ID: Frank13725496420). Every Wednesday, 8.30-10pm; free entry. Tristan’s CalMex Restaurant & Bar. John Williams is a household name, known for composing music for some of the most famous films of the 20th century. Having created music for over 90 films, the renowned American composer won five Oscars, 18 Grammys and three Golden Globes over the course of his musical career, which spans over 50 years. 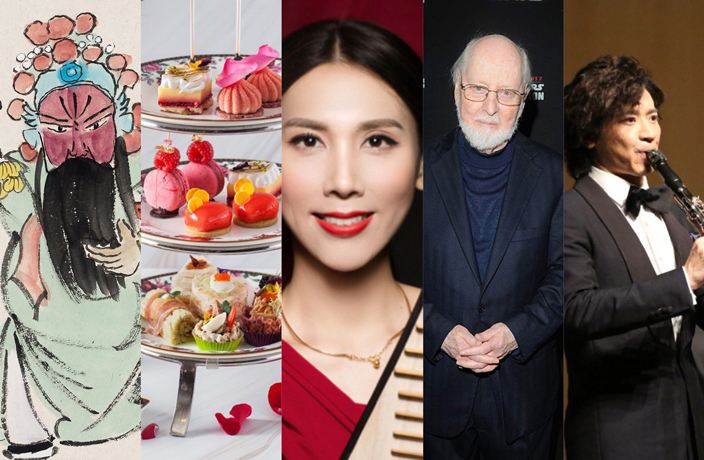 This Valentine’s Day, a concert featuring movie scores from Star Wars, Jurassic Park, Superman and Raiders of the Lost Ark, among other well-known films, will be staged at Xinghai Concert Hall. Feb 14, 8pm; RMB80-680. Xinghai Concert Hall. See event listing. Tickets. On Valentine’s Day, a romantic concert will be staged at Guangzhou Opera House, featuring dozens of heartwarming tunes performed by highly sought-after clarinetist Wang Tao. Active onstage since the age of 11, Wang has held concertos around the world and has three albums under his name. His performance will be accompanied by up-and-coming Japanese pianist Akimi Fukuhara. Feb 14, 7.30pm; RMB80-280. Guangzhou Opera House. See event listing. Tickets. One the most renowned Chinese folk music ensembles, Guangdong National Orchestra boasts members spanning all ages, giving vitality to this traditional Chinese orchestra. Having established itself as an independent national orchestra with more than 1,000 works in its repertoire, the orchestra has collaborated with many prominent national artists and has expanded its ranks with top graduates from famous conservatories on the Chinese mainland and in Hong Kong. Feb 16, 8pm; RMB80-380. Xinghai Concert Hall. See event listing. Tickets. For this special CNY event, Asian Power gathers more than 10 up-and-coming rappers, DJs and hip hop musicians at Mao Livehouse this week. As the first show of the Year of the Pig to be held at the popular music venue, the host will set up specially made videos and installations for audiences to enjoy and explore. Feb 16, 8.30pm; RMB128 early bird, RMB158 presale, RMB198 at the door. Mao Livehouse. See event listing. Tickets. Growing up in Paris, Frenchman Frederic Payet is a self-taught impressionist painter based in the US. Choosing propylene over oil to give his artwork new textures, Payet’s paintings depict scenes of the French countryside and American metropolitan cityscapes. Tue-Sun until Feb 17, 11am-8pm; free entry. i-club·MO2art Gallery. See event listing. Calligraphy and painting have been well-received in literary and art circles throughout China’s history. Artist Liu Shaobai is a master of this time-honored art form. His works have been nominated and won numerous awards in national exhibitions. At Kui Yuan Gallery, Liu’s works will be showcased, offering audiences an opportunity to enjoy traditional Chinese paintings. Tue-Sun until Feb 17, 11am-8pm; free entry. Kui Yuan Gallery. See event listing. Feb 9-19, 2.30-5pm; RMB268 for two. Portal (Langham Place, Guangzhou). See event listing. Featuring fancy chocolate lipstick and handbag-shaped shortbread goodies, the Pretty in Pink afternoon tea at Guanxi Lounge is aimed at girl pals looking to enjoy a stylish get-together. A total of 11 tasty treats are available for patrons to enjoy, along with two glasses of rose sparkling wine. To place your reservation today, call 8396 1234. Ongoing, 2.30-5pm; RMB298 for two. Guangxi Lounge (Grand Hyatt Guangzhou). See event listing.